Despite being a regular visitor to the West End for over 25 years, Miss Saigon was a new experience for me. It was a show I knew very little about, despite its near 30 year presence on the stage, but the atmosphere and buzz emanating from the auditorium suggested that this show was popular and an eagerly anticipated arrival in the Theatre Royal Plymouth. The preset was a drab safety curtain, reflecting the conventional colours associated with camouflage and the proscenium arch, decorated with dark wooden structures, gave the impression of a ramshackle, insecure environment. This combination instantly sets a rather sombre mood which is an underlying tone throughout the whole performance, one which is essential when dealing with the delicate subject matter being presented on stage. The sound of a helicopter instantly pierces the quiet whispers of the audience as we are thrown into the dark, disorientated and then catapulted into the world of The Engineer, played by Red Concepción, a Vietnamese pimp running a whore house for the American GIs. It’s a vibrant and graphic opening, detailing the exploits of the Soldiers and the desperation of the women to make money and secure themselves an American Visa. The central storyline then begins when Kim, played by Sooha Kim, a young Vietnamese virgin meets solider Chris, played by Ashley Gilmore just before he is sent back home at the end of the war. The story of their meeting, separation and conclusion spans 3 years allowing the audience to witness elements of Vietnam’s extremely sad history and beautiful culture such as the heart wrenching visual presentation of orphaned Vietnamese children and Kim and Chris’ moving ‘wedding’. Miss Saigon constantly alternates between the fast paced scenes of the brothel and military, displaying some expert choreography, and delicate scenes of raw emotion as shown between Kim and Chris. The structure of the show seems to reflect the tumultuous nature of war, its impact on a country and the lives of the civilians; uncertainty and disorder causing chaos. The relationship between Kim and Chris, and its tragic finale acts as a metaphor for the destruction that was left behind in the years following the Vietnam War; the soldiers may have left but the devastation remained. Both Sooha Kim and Ashley Gilmore gave stellar performances, with Kim successfully creating an innocent and naive young woman who grew into a protective and determined mother and Ashley Gilmore offering a realistic portrayal of a soldier deeply affected by his military experience. Their musical numbers were expertly delivered, both with beautiful tones to their voices which made for inspiring harmonies. Also noteworthy was Ryan O’Gorman’s portrayal of John, a soldier and friend to Chris, who demonstrated so effectively how soldiers became entrenched in life at war acting in an almost primitive fashion, yet on their return realise the shameful consequences of their actions. However, it was Red Concepción who stole the show. Despite the manipulative and greedy nature of The Engineer, Concepción created a cheeky character who offered the occasional comic relief from melancholic situations and, at times, allowed a hint of vulnerability to seep out allowing the audience to understand his desperation to get to the USA. 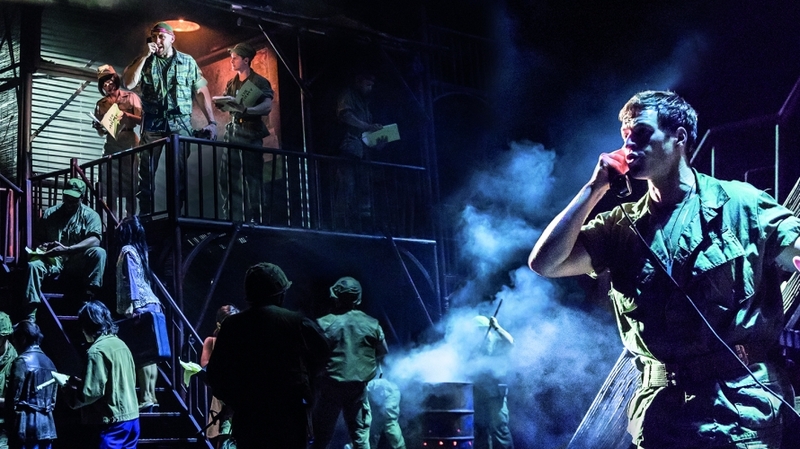 The staging of Miss Saigon is visually very impressive with moving trucks, enabling the scenes to run swiftly and seamlessly, invasive sound effects and a number of startling special effects. The realism of the helicopter scene will be particularly memorable as is created such an intense impression of events that have been played out before. Miss Saigon is not a light hearted show; it is based on a part of history that is incredibly harrowing and, whilst the story focuses on the relationship between Kim and Chris, it is not a traditional love story and not a performance that will leave you feeling sanguine. But if it did, then they would not have captured the essence of the time period. The musical numbers are powerful but, in my opinion, not particularly ‘catchy’ as could be said of other musicals but, again, this would detract from the impact of Miss Saigon. I am glad I have finally seen Miss Saigon, the acting was brilliant, the singing was passionate, the set was interesting and I feel that the company did an extremely successful job at delivering such a tragic story.